When you need to complete the look of an event and make sure that your guests receive high definition visuals for what you have planned for the event, LED walls send this message across beautifully. Whether it is a corporate conference, a poignant wedding event, a star-studded award function or an interactive gala, an LED wall will grab the attention of your guests and keep them hooked throughout the event with crystal clear visuals. Buying an LED wall for a single or a couple of functions does not seem like a smart move. But what else can you do in order to give your guests the best experience, yet not put a burden on your budget? Why, rent an LED video wall, of course! With Toronto Audio Video Rentals, you get the best bang for your buck! 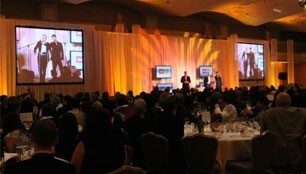 You set the theme for the event, and we provide you with the equipment to execute the program in the best way possible. Oh, and did we mention that you get to save money, too? There are many who can claim to provide the best services and be the “number one” audio video rentals around. We don’t claim. We deliver. Our video walls make sure that your guests do not have to scramble for the front row seat to be able to see clearly. The walls are able to display pictures, videos, animations, text and graphics with crystal clarity. When you choose our services, all you need to do is compile all you need to be displayed in your laptop, and quit worrying about how they would be displayed. Rest assured, your guests at the far end of the room would be easily able to see your hard work on the screen (no squinting required). In an event, there is always a center stage where all the excitement is instigated. 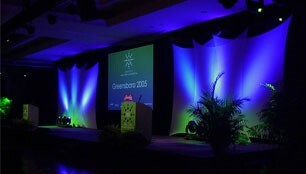 And if this stage is not able to hold the attention of your audience due to patchy display, it would put a damper on the event. We guarantee that you would not be left abashed on the stage with a file that does not open. Our video walls come to the rescue and set up a video wall that is able to play files in various different formats such as .jpg, .png, .txt, .doc, .avi, .flv etc. What is more, our video walls are weather-protected, so you can easily have them installed for your outdoor event without worrying about rain. Note that we mentioned “have them installed”. You simply have to point and our team of professionals will install the LED video wall wherever you need it to be. Pick up the mic, strut to the stage, and let the celebrations begin. So, is the thought of having a stress-free, cost-efficient, crystal clear display installation for your main event starting to sound like a great idea? Awesome! contact us today to discuss your needs!